A few weeks ago, as we were getting ready to leave the summer house and return to the City, I decided to cut some of the deep blue aquilegias that grow between the paving stones in the courtyard. I know they’d bloom while I wasn’t there, so I figured the budding flowers would look nice in a vase in the apartment, and so they did. Of course there’s always a risk that the seeds won’t be true to type, but considering that I have no other colours of aquilegia in the apartment, I’m feeling confident that the seeds will produce the same lovely colour if I sow them out in the Ambitious Border. 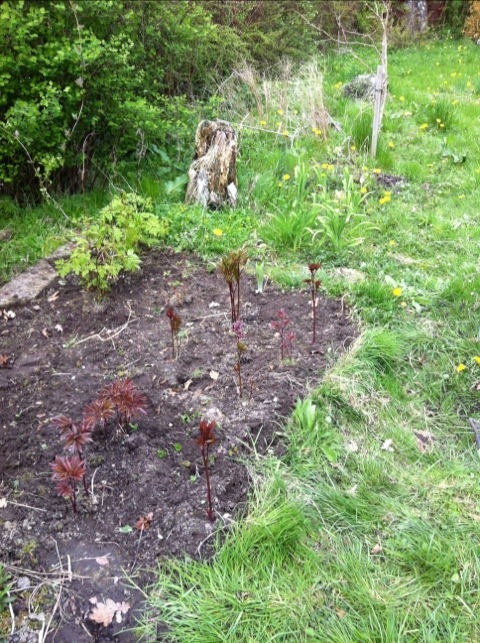 So, this means that I have now used cut flowers and branches to propagate forsythia, dogwood and sedum so far, and with aquilegias in the making. I’ve said it before, and I’ll say it again: Free plants are the best! Why, yes! It’s a black plastic tub! It’s about a foot deep, 1½ft wide and 2½ft long! In other words it’s a miniature pond in the making… One end will need to be filled up with stones and tiles so animals that fall into it will have a place to crawl out out the water, of course, and I’m hoping that if I dig the hole deep enough I can have the soil sloping down to the tub’s edge, making it more easily disguise-able by plants. 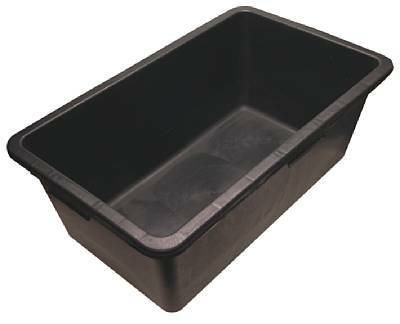 I’m as thrilled as, well… As a gardener with a black plastic tub! Time will tell whether I manage to turn this into a miniature pond or whether it will turn into a slimy green bog of algae, but I feel confident that if I start with a visit to the local aquarium shop and get some oxygenating plants going from the start, the problems can be kept at a minimum. It will go somewhere in the corner down by the hedgerow where it can be seen from the house but also gets some shade and provides easy escape routes for animals. After all, animals are the main reason I want a small miniature pond/puddle; I especially hope that over time it will increase the number of frogs and toads in our garden, but of course the birds will be welcome as well. I’m terribly excited about this. project, but of course – inevitably – it involves more digging… So I need to site the mini pond far enough from the trees that at least I won’t have to get tangled up in tree roots, and also it needs to somehow fit into the overall scheme for the Ambitious Border, since it will be at the very end of the stretch of the border that has not yet been created. Okay, so that picture is a recycled one from my post on the lawn, but to be honest there were areas in The Ambitious Border that looked much the same. Before I started the weeding, my Mother-In-Law mentioned that she wouldn’t know what was weeds and what wasn’t, and to be quite honest the mess in the border didn’t give any indication of what was supposed to be there and what wasn’t, but by Saturday afternoon she could definitely see what was supposed to be there, because there was nothing else! Anyway, back to the little blue beauty! It has a creeping, spreading habit, and then it sends up its little flower spikes “soaring” 5 inches above the ground, so I figured that a) the lawn would inevitably encroach on the clear area around the 5 New Dawn roses I planted by the two hammock trees (a blood plum and an oak) so I might as well try to control which weeds will grow there, and b) these plants have such small, shallow root systems that I can’t imagine they will compete too much with the roses for food, especially considering that they are right next to 20-foot trees. 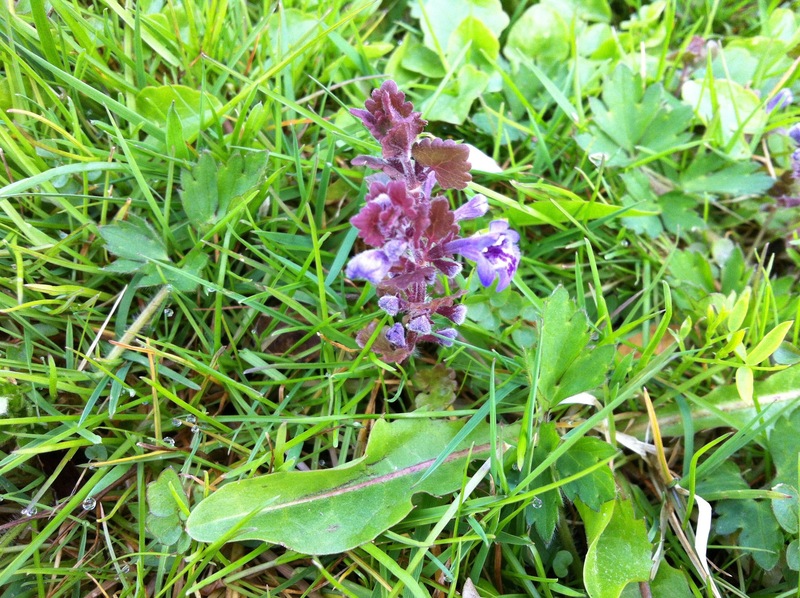 Today I realised, much to my joy, that the little blue beauty has a name; Ajuga Reptans (“creeping lip-less” in Danish; not the most flattering name! ), and it’s actually not just a weed but also a perfectly accepted ground-covering perennial that can be bought from nurseries and garden centres! I do hope they will spread out nicely on the bare soil around the roses now that they have no competition from grass and other weeds. So there, an upgrade from weed (although pretty) to a desirable perennial! Thank you, Google! I might not get a LOT done this weekend, but what I do get done makes a visible difference! Another stretch of the Ambitious Border has been weeded (shouldn’t it actually be “de-weeded”? ), and now I only have one meter left before I reach the end of the bed. -Then, of course, I might extend it, because the ambition is to let it follow the entire length of the hedge, but I do have to pace myself. Between the spots where I had annuals last year and the spots where the acanthus and the globe thistles have gone AWOL, I now have enough space for most of the perennials that are currently in temporary storage beds, so I can actually start thinking about where to put each group of plants. Next weekend I’ll be up here with the Flâneur Husband, so we can plant the border together and get the vegetable beds sown up. And maybe extend the border a little to make room for sowing some annuals? 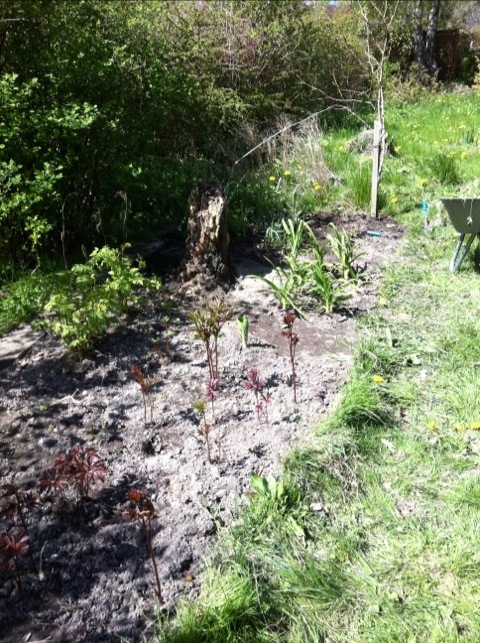 Yesterday I started on the weeding of the Ambitious Border… Oh dear; more like “the area where perennials grow in the lawn”, actually, but at least I have now cleared a section of it – and managed not to damage the plants in the process! I only did about a third of it, though, because a) it’s backbreaking work and b) I’m up here with my mother-in-law this weekend, and it seems unsociable to have one’s head in a flower bed while having company, doesn’t it? Mind you; I’ll do another section today, and then perhaps the final furlong on Sunday, so when the Flâneur Husband comes up here next weekend it might actually be possible to see what’s lawn and what’s flower bed! The peonies, bleeding hearts, astilbes and a single hosta have been liberated so far, and next up are the day lilies and goldenrods. There should be an acanthus in there somewhere, but I can’t spot it at the moment, and I’m sure my mother also planted some globe thistles when my parents visited last spring… We’ll see if I find them in the mess! Pack up loads of plants from the windows of the apartment and bring them up to the garden. Mow the lawn/jungle if and when the weather is suitably dry. Plant up pots in the courtyard. Weed the Ambitious Border and the Evening Border. Build ad hoc cloches for the tomatoes and dahlias. Divide and plant the hostas from my mother’s garden that have overwintered in a pot in the courtyard. Wash all the bedlinen to get that musty winter smell out of them. Take at least one outing on the fjord in my kayak. It’s a tall order, but if I get just half of it (okay, two thirds!) done I’ll be happy enough.